Naspers owns 31% of Tencent - worth $138 billion. Yet Naspers' market cap is just $98 billion. All of Naspers' other investments are currently valued at $0. Naspers has successfully invested in many other tech companies including its early investment in Flipkart - which netted them $1.6 billion. The market is missing a huge opportunity. It’s severely mis-pricing this one company. It’s pricing this company’s main asset for just $0.71 on the dollar. And every one of its other investments are essentially priced at $0. If the market just prices its one asset at fair value, we’ll make 41%. The rest of its investments are all further upside. This provides a huge margin of safety for us. That’s why we recommend you put money to work in Naspers (OTC:NPSNY). Naspers is a publicly traded company headquartered in South Africa. It invests in tech companies around the world. It bought a $32 million position in a little tiny Chinese company called Tencent back in 2001 – about 1/3 of the company. That investment turned out to be one of the greatest investments ever made… as Tencent is now valued at $446 billion. (Naspers sold 2% of its position back in March 2018 – locking in a cool 60,000% return in 17 years. It freed up $10 billion for other investments). 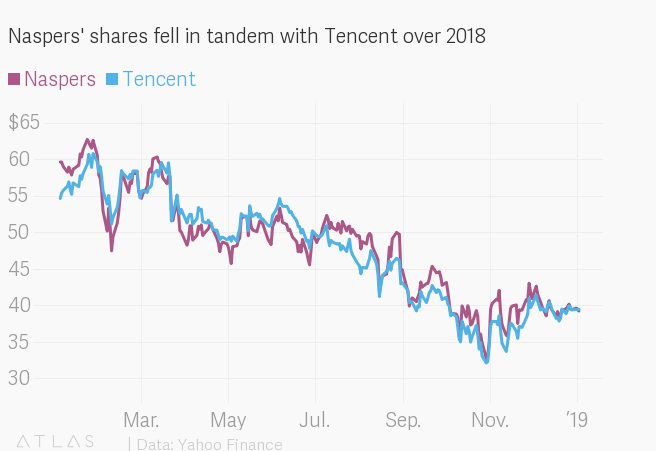 Naspers still owns 31% of Tencent. This would mean Naspers’ position in Tencent is worth $138 billion. Yet Naspers’ market cap stands at just $98 billion. You may know the likes of some of them: Udemy, LetGo, and SimilarWeb. It also owns a 1/3 stake in MakeMyTrip (MMYT) – valued at $1 billion. A 28% stake in Mail.ru (MLRYY) – valued at $1.7 billion. And another notable investments like DeliveryHero – a global food delivery company that rivals GrubHub. And PayU – an emerging PayPal competitor with global reach. Their India business alone has been valued at over $2.5 billion by Citi. PayU also makes strategic investments in other payment-related startups. They acquired ZOOZ, an Israel-based payment company. Other investments have included a $110m stake in credit scoring company Kreditech and a $115m stake in Remitly. Naspers also has $8 billion in cash waiting to be deployed. There are just too many ways to make money in Naspers. One of which we see is to continue selling off their Tencent stake… bit by bit. They’d then use that money to invest in other startups. Naspers did make $1.6 billion selling its stake in Flipkart to Walmart – netting them a near 300% return on their investment. Another way to make money is to split off their Tencent stake entirely. Naspers is strongly correlated to the price of Tencent. So splitting off their stake entirely will let investors see the value in its other businesses. Oh… and we didn’t even mention what a trade agreement between the U.S. and China would do to Tencent and Naspers. This is an investment you should add to your portfolio ASAP. Buy Naspers (OTC:NPSNY) up to $50.